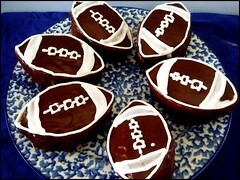 Do you know what you're making for the Super Bowl? 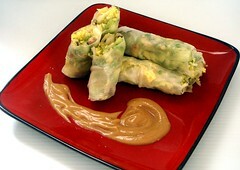 If your menu isn't complete yet, take a look at a few of my recipes for ideas and inspiration. 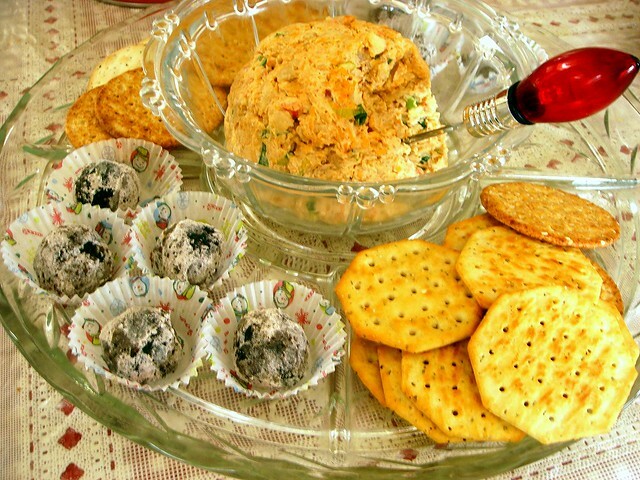 All the recipes are delicious, and some are quick to prepare or can be made ahead of time. A sneeqpeek representative contacted me last week about hosting a giveaway for my readers. After reading up on it and looking around their site, I decided that it would be a great prize for you guys. Sneekpeeq is a virtual boutique offering limited time products for a great value. You have the option of purchasing through three sub-store categories, living, style, and taste. Right now in the Taste boutique, I can decide between a selection of gourmet chocolates, cookies, and toffees. Each day you receive twenty "peeqs" to use throughout the store. To use them, simply click on an item's price tag to peeq at the discount price. If you like the item, add it to your cart. For my readers, SneekPeeq is offering one lucky winner a chance to win a $10 discount to go shopping. It doesn't sound like much, but I can say with certainty that it goes a long way when combined with the marked down prices. - Giveaway ends on Wednesday, February 1, 2012, at 12 p.m. 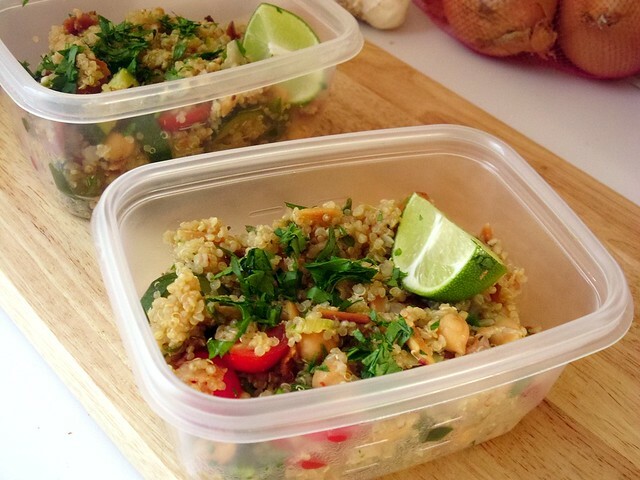 In need of a healthy and tasty lunch? Look no further than this salad, featuring protein-packed quinoa and toasted almonds. 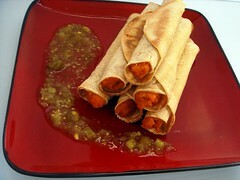 Using Martha Stewart's recipe as my starting point, I switched out various vegetables and added other ingredients. 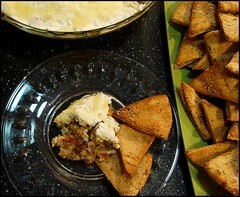 I also used dried thyme instead of fresh. Otherwise, I followed the cooking method exactly as written. The ingredients were prepped and I began sauteing the green onions, onions, garlic, and red pepper flakes. After the onions soften, the quinoa is added along with water, thyme, and salt. 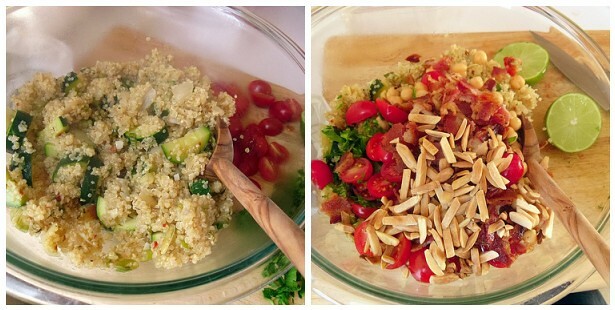 Halfway through, sliced zucchini is mixed into the quinoa. The total cooking time to cook the quinoa was about 17-20 minutes. As the quinoa cooked, bacon was cooking in a skillet and almonds were toasting in the oven. 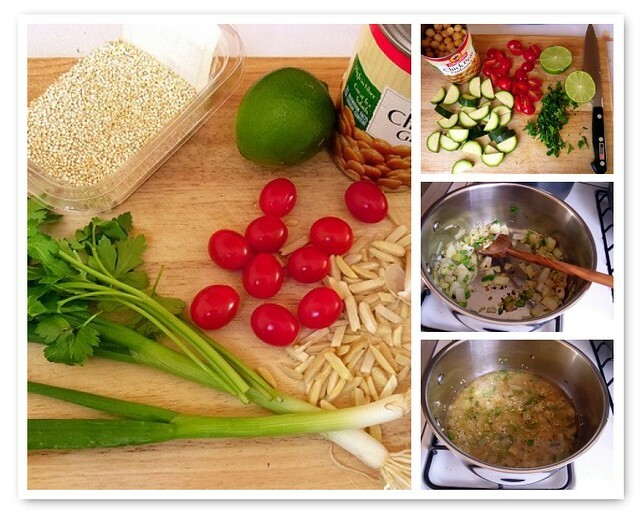 The remaining ingredients were prepped and ready to be tossed with the quinoa. 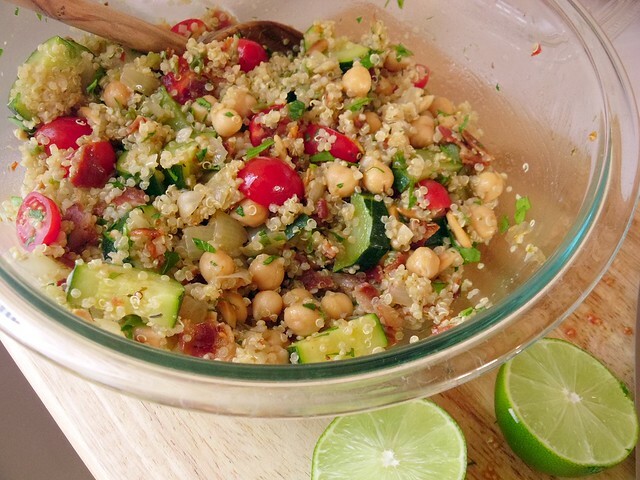 Place the cooked quinoa into a large mixing bowl to toss with additional ingredients. The flavor of the thyme with the heat of the red pepper is really delicious. 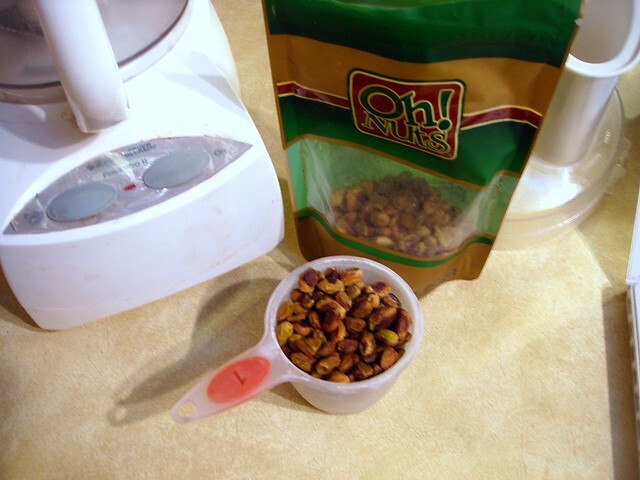 I would recommend that you do not leave out the toasted almonds because they add a lot of flavor and crunch. Each portion is packed with a lime wedge to be squeezed over the salad before serving, which adds another dimension of flavor. I would recommend adding chopped flat-leaf parsley, too. 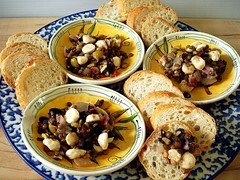 Besides packing for lunches, this would make an excellent light dinner or tasty side dish. 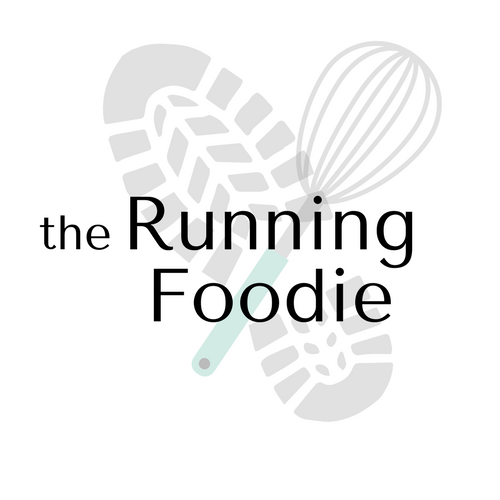 I hadn't planned on blogging about this granola. I made it on a whim for breakfast since cereal isn't very filling and I don't always want to eat eggs (hot oatmeal doesn't do it for me). 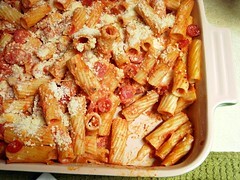 This is probably the least complicated recipe I've made, but it is one of the best. It has quinoa for a little protein, and is packed with fruit and nuts. I didn't use much much quinoa because I wasn't sure of the proportions, so next time I'll add more. 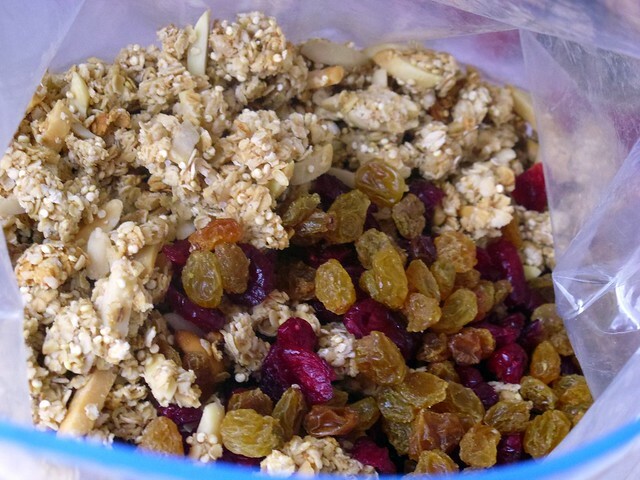 To make this granola, dry ingredients, minus the dried fruit, are mixed in a large bowl. The wet ingredients, butter, pancake syrup, and a little orange juice, are heated together until the butter is melted, then poured over the oatmeal and mixed until coated thoroughly. Little clusters will begin to form. 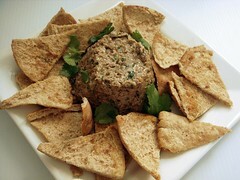 Simply spread it out on a greased baking sheet and bake for a quick thirty minutes. The granola will be lightly golden. I like how the clusters of oats are studded with quinoa. The quinoa doesn't have too strong of a taste when it's eaten like this. I've been craving crunchy granola bars and I just might have to play around with this recipe to see what I can do about it. The quinoa will definitely help with the crunchiness. When I think of granola I think of crunchy clusters of sweet, crispy oatmeal with nuts and dried fruit. Well, there are clusters here - many of them. It ended up not being as sweet as I expected, but the sweetness of the dried fruit helped out. Instead of using honey like I normally do I subbed it with pancake syrup. That's probably why it wasn't as sweet. I ate a bowl with Greek yogurt, milk, and fresh fruit. I didn't mind that the granola itself wasn't very sweet because I don't want to ingest a sugar bomb so early in the day anyway. 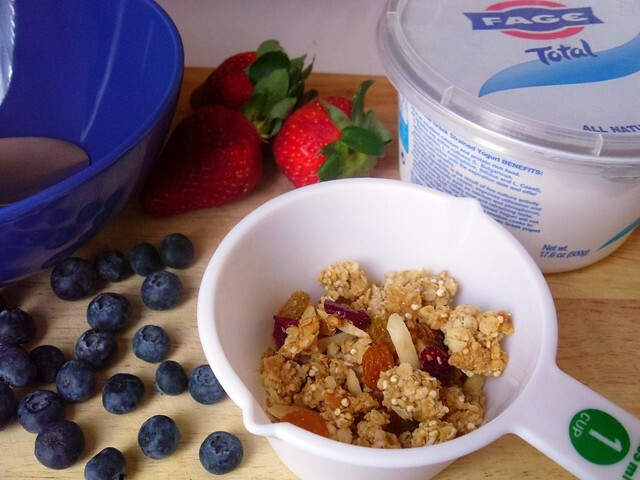 Try it out for yourself if you want a healthy, tasty granola. Preheat oven to 300°. Grease a rimmed baking sheet. In a large bowl, mix together oatmeal, quinoa, and almonds. In a medium, microwavable bowl, heat the pancake syrup with the butter, orange juice, and pinch of salt for 2 minutes on high heat, stirring occasionally until butter melts. Pour over oatmeal mixture and stir until oats are coated and clusters begin to form. 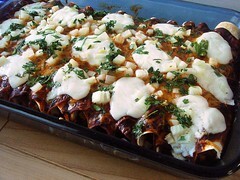 Spread evenly onto prepared baking sheet and bake for 15 minutes. 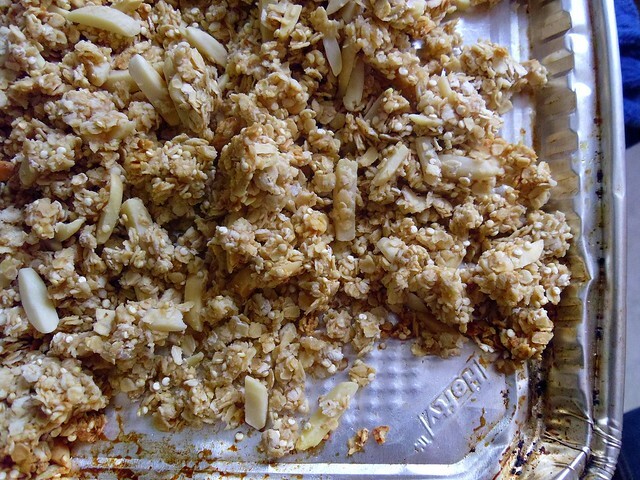 Remove sheet from oven and stir granola. Bake for an additional 15 minutes; granola should be lightly golden and crisp. Let cool for 10 minutes before mixing with dried fruit. So, it snowed this week. I guess that means winter is finally here, so now I have to put up with the flaky white stuff, winds, and chilling temperatures for the next two-three months. It's not so bad when I get around to baking, which is what I did this weekend. My long run was on Saturday and I was anticipating cold, anger, and rage, so I decided to make a dessert to look forward to eating afterward. I didn't want a cake, tart, or some sort of pretentious dessert that takes five hours to prepare, just something warm and comforting. 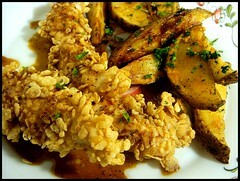 After reaching that conclusion, my mind shifted to cobblers, crisps, and the like. That led me to my final destination of Emeril Lagasse's Apple-Of-My-Eye Crisp from There's A Chef In My Soup!, a cookbook I had given my brothers a very long time ago. Lil bro had often made the apple crisp and it became everyone's favorite. 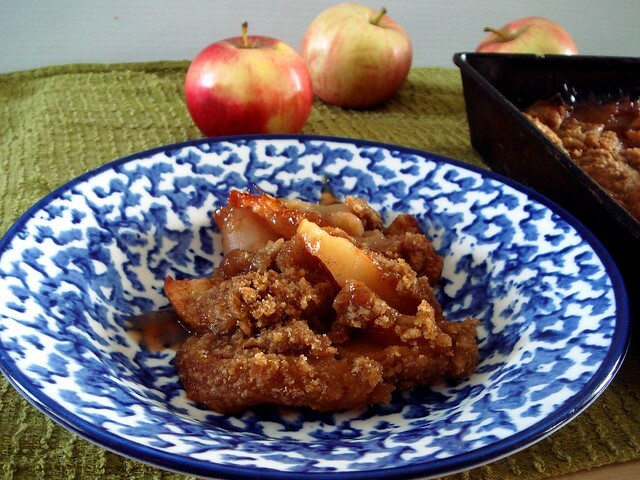 What I like about this recipe is the perfect buttery, crispy topping, and the tender apples become that are infused with flavor and suspended in caramely sauce. I forgot that my brother always doubles the topping, uses more brown sugar and less granulated, and increases the apple filling by half, so I made it again yesterday. I'll include the recipe for the normal amount of apples and double the crisp, because the best part of a crisp is... the crisp. Right? 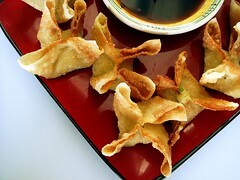 To make the topping, mix together flour, a pinch of salt, and both brown and white sugar. 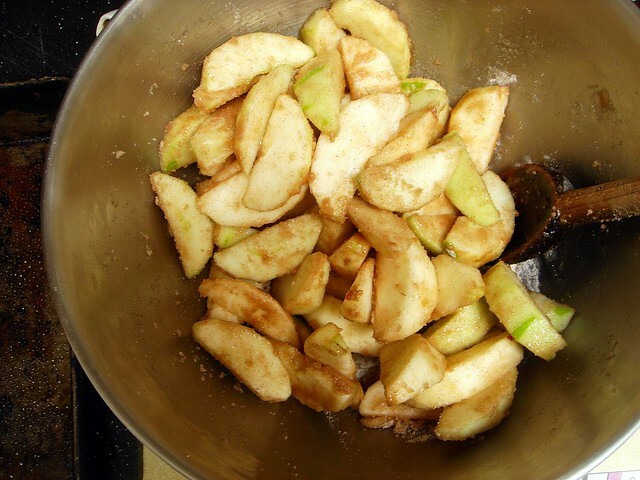 Cut in the butter until the mixture is coarse, then chill in the fridge while you prepare the apples. 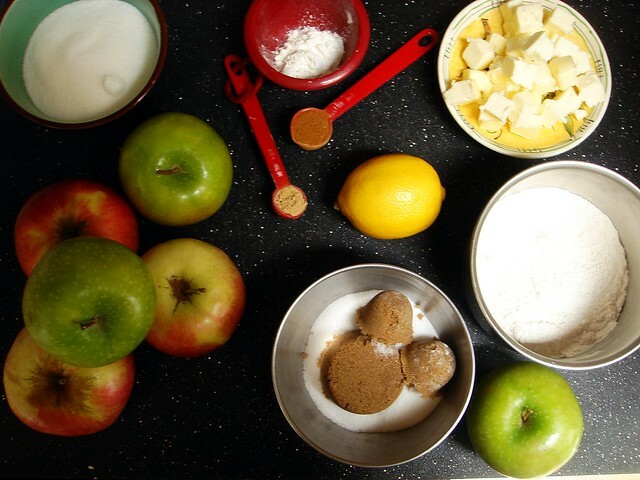 The recipe calls for two types of apples, Granny Smiths and Golden Delicious, though I used Granny Smiths and a firm red apple suitable for baking. The apples are thickly sliced to keep them from breaking down during baking. The apples are then tossed with lemon juice, then the sugar-corn starch-cinnamon-ginger mixture. It doesn't look very saucy, but as the apples cook the moisture is released, which helps create the juicy, thick, and spicy sauce. 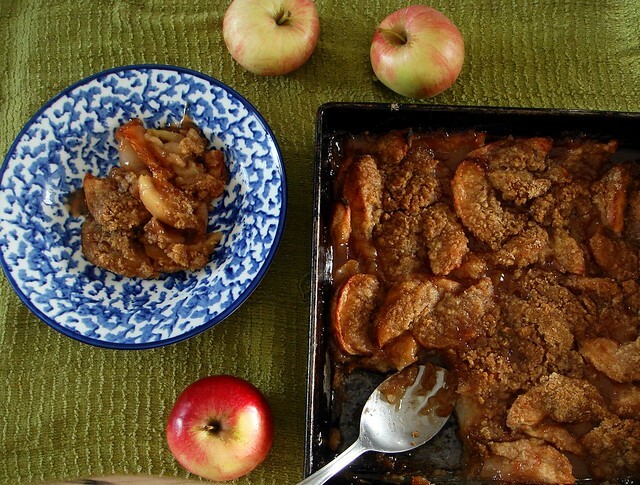 Carefully spread the crisp topping over the apples, then bake for an hour and fifteen minutes until the apples are bubbly and the topping is a deep brown. After it bakes, you might be tempted to dig right in. It smells delicious and looks tempting, but you'll probably burn your mouth and the filling won't have set, so let it rest for a little bit. If you don't have any, now would be the perfect time to go on a whipped cream run. You can eat it plain but the cream goes really well with this. Next time it snows and you're looking out the window in disgust, don't bother leaving. Just head on in to the kitchen and get baking. In particular, this apple crisp. From There's A Chef In My Soup! Preheat oven to 350°. Grease a 9x9-inch baking dish; set aside. Place the flour, brown sugar, 1/4 cup granulated sugar, and salt in a medium bowl, whisking to combine. 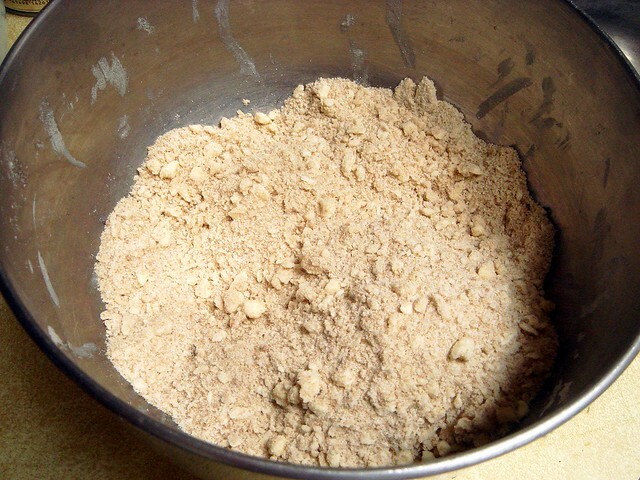 Using a pastry blender, cut the butter into the flour until the mixture resembles coarse crumbs. Refrigerate crumb topping while preparing remaining ingredients. Peel apples, slice in half, then cut out the core. 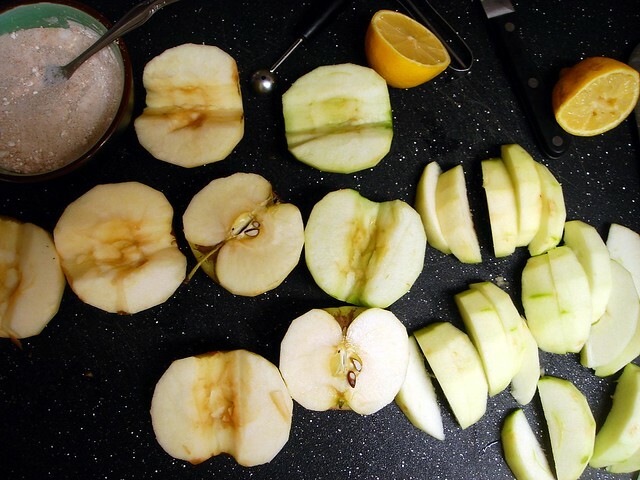 Place one apple half on the cutting board and cut lengthwise in six slices. Place the slices in a large mixing bowl and toss with the lemon juice. Mix the remaining granulated sugar, cornstarch, and spices together. 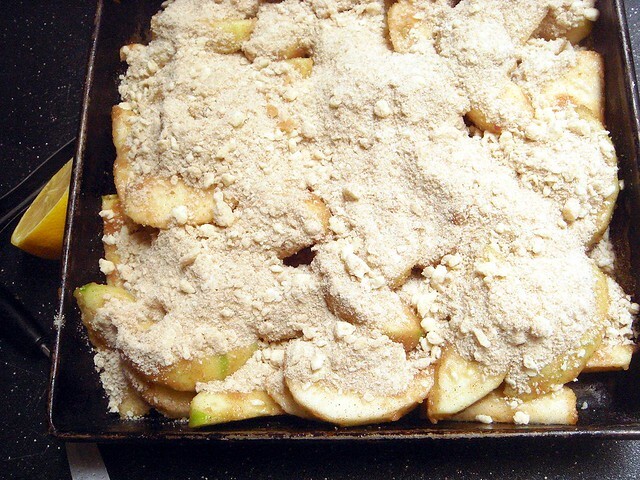 Toss with the apples until well-coated. 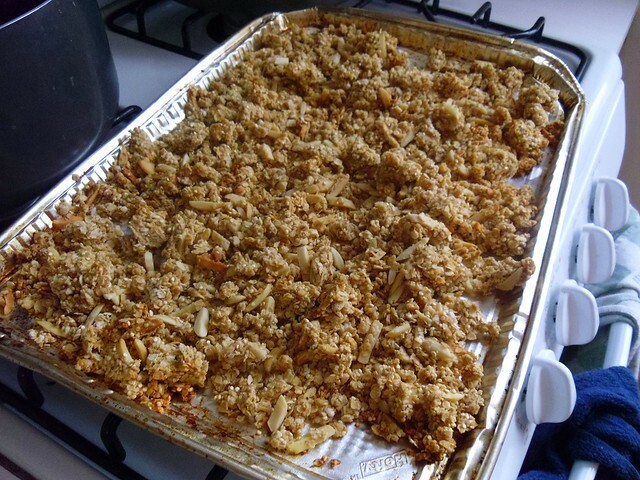 Pour the apples into the prepared baking dish and crumble the topping evenly over the mixture. 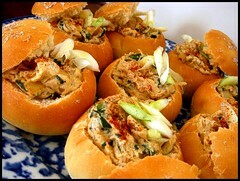 Bake until golden brown and bubbling, about 1 hour and 15 minutes. Carefully remove the dis from the oven and cool on a wire rack for 10 minutes before serving. This was a decent week of running. It started out really cold, snowy, and wintry, but the latter week warmed up nicely and wasn't too bad. I hope it won't get much worse, though you never know around here. Saturday marked the fourth week of running over twenty miles. It's a doable distance on four days of running a week, though I'll be adding a fifth day soon to prepare myself for running more often. Minor changes for 5-a-day weeks include adding short runs of three miles and reducing the mileage in my midweek runs to one four, five, and six-miler instead of two five or six milers. The long run remains the same. As for the long runs, I've gotten through three seven-milers and an 8.5 miler pretty well, which leaves me hopeful for half marathon training. In two weeks, I'll alternate between eight and nine milers to slowly increase my endurance. Most of my runs have been at a slightly quick, yet still manageable pace. I start off slow, then speed up during the latter half of a run. While it feels alright, and considering I haven't done any speed work it's not too bad, I realize I need to focus on maintaining a legitimate slow pace. This week, I'll run two of my runs at a 9:30 pace, specifically the long run and a midweek run. The remaining two will include strides each mile, and a mid-range pace run, so something around 8:40-50. I'll see how that goes. 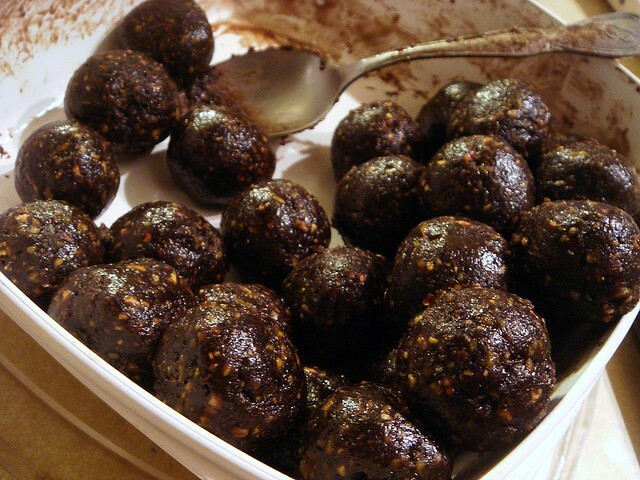 I still remember the day I tried my first rum ball. It was part of a Christmas cookie package and the aroma of the rum permeated the tin. It was chewy, strong, and delicious. 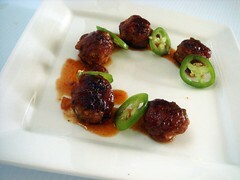 Immediately afterward, I looked up recipes and was amazed by how simple rum balls are to make. It's almost like a Larabar in texture, though very unlike a Larabar except for the nuts. Do you think they'd ever make a rum ball Larabar? 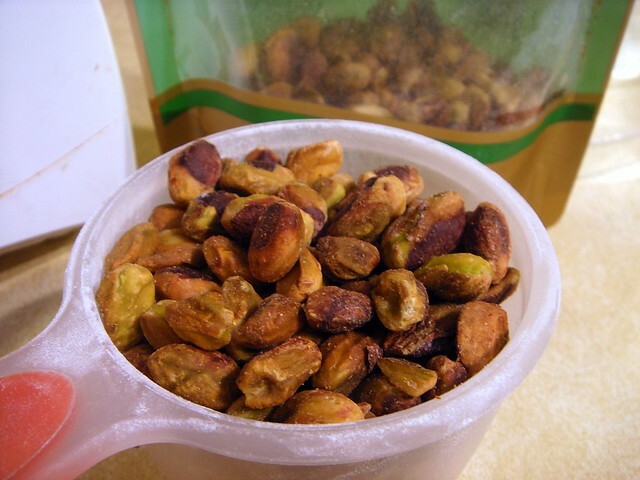 Oh Nuts had sent me these roasted, unsalted pistachios back in December. I had thrown ideas around, never settling on anything. Time eventually flew by and I still hadn't made anything with them. 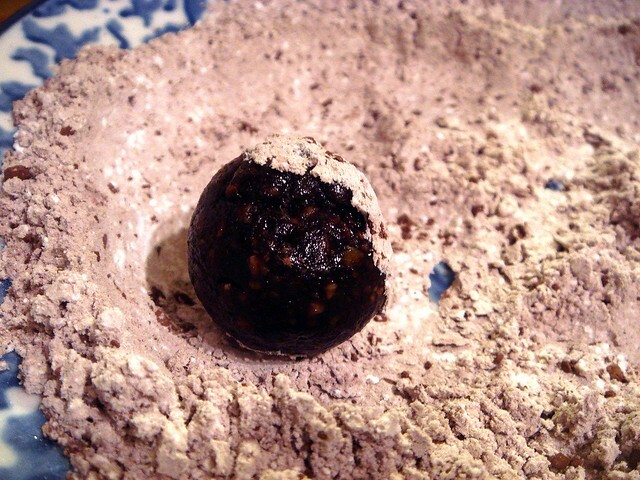 As New Year's approached, I decided the proper use for them would be in a rum ball. 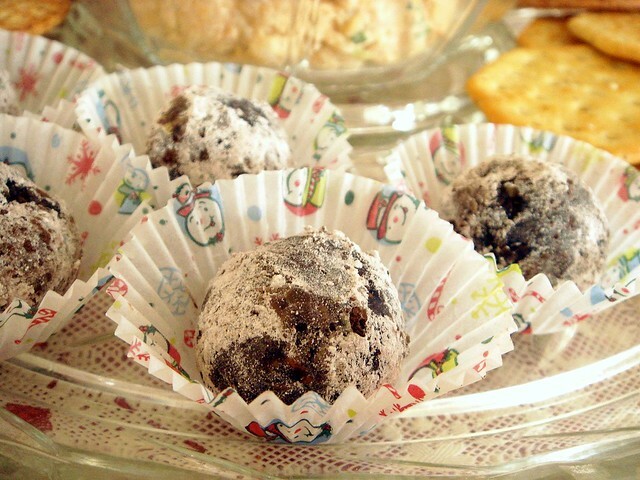 Rum balls are classified as a no-bake cookie. All you do is finely grind the nuts, finely grind vanilla wafers (or puffed rice cereal, shortbread cookies, etc. ), and mix the two with confectioners' sugar, a bit of cocoa powder. The dough is made by stirring in rum and corn syrup. I hadn't finely ground the nuts enough, or the wafers, so I think it affected the consistency. I added a little extra water, corn syrup, and rum. I wanted to add more rum, but I hoped the amount I did add (1/3 cup total) would become stronger as the dough refrigerated overnight. When I started rolling them out, I tasted a bit of the dough. There was a little bite of rumminess in the back of your throat, but it wasn't as strong as I remembered. 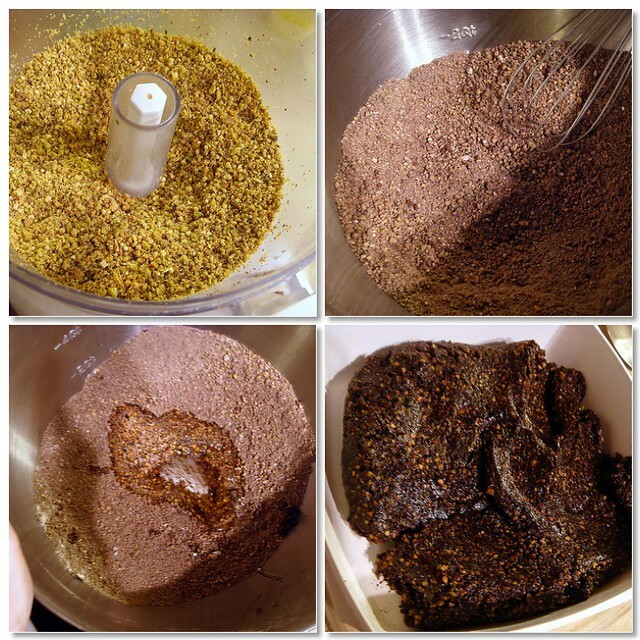 I ended up liking the flecks of pistachio and was glad I didn't grind them more finely after all. You can coat these in anything you want, like melted chocolate, chopped nuts, sprinkles... I chose cocoa powder mixed with confectioners' sugar. It's a good thing I didn't add more rum or else nobody would have enjoyed them. I'll have to make myself a stash of rum balls some other time. The texture on these was great. They held their shape, but it was very soft and chewy. They're addictive, though I only managed 5 over the course of the night. 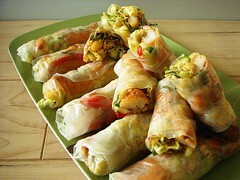 I bet these would be great to fuel a run, don't you think? 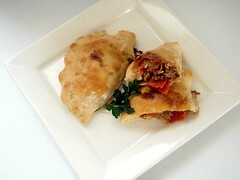 If you're interested in the recipe, check out the recipe at Joy of Baking.